Hot Shield Fire Resistant Respirator Housing Model HS-5 is designed specifically for the Draeger brand, model Xplore 3500 Half Face Respirator. The HS-5 has been designed by firefighters for wildland firefighting, but has found application in other industries utilizing this particular model respirator. The US patented design provides for several benefits. Its primary benefit is a high degree of thermal protection to face & neck areas. This is accomplished by use of highly thermally resistant materials and adequate airspacing, both of which are crucial to meet the goal of protecting the human skin. We use CarbonX materials, a proprietary material tested to withstand over 2000 degrees Fahrenheit. The combination of our housing with an efficient and user friendly respirator means users readily use and are comfortable wearing the device for extended periods. This special combination also allows fit testing of individuals as the respirator itself seals to the users face. The interior materials also absorb perspiration, adding to overall user comfort. The HS-5 protects the user and the respirator. Features 3M Scotchlite Reflective Trim for nighttime visibility. Fastens behind the neck (Velcro). One size fits all, machine washable. 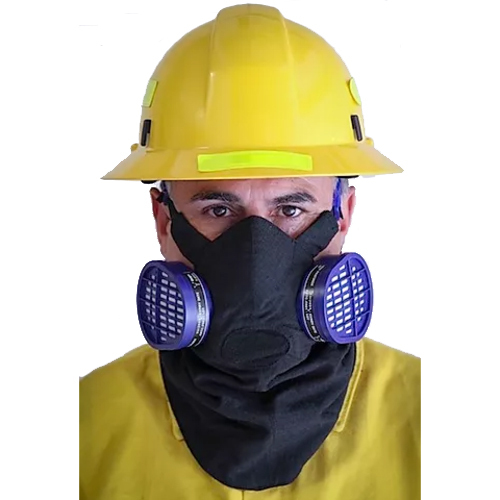 This face mask is designed SOLELY and EXCLUSIVELY for the Draeger Xplore 3500 half face respirator. Extreme thermal protection for the face and the Draeger respirator. Does not include Draeger Xplore 3500 Half Respirator!